Cherries on Top Hunt #5 | ! *PurpleMoon Creations* ! 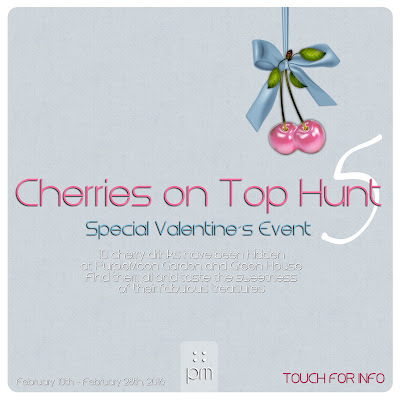 Once again "Cherries on Top Hunt V" brings fun and love to SL! 10 cherries have been hidden at the PurpleMoon Gardens, find them and taste the sweetness of their fabulous treasures! 3- To receive the gift, simple touch the drink. You will be given an object that can be worn to unpack. 6- The prizes have been hidden in the WINTER GARDEN and GREEN HOUSE ONLY. Not in the store. Smell the roses and visit our guests designers on their Valentine's Yard Sale. The green house has been turned into a dance area for you to bring your loved ones and get them to move along some romantic tunes and help you hunting!